In a couple of days we’ll present a book with sketches for future museums. The book “Sketches for a National Museum of History” explores possibilities for museum architecture. Kenneth Frampton and Hans Ibelings wrote essays, researchers at the Berlage Institute made design sketches, and three young European architecture firms, 51N4E, Baukuh and Monadnock, submitted plans to encourage thinking about a new museum architecture. I had a chance to look at the book and I must say it’s inspiring and the designs are daring and different from what you’d expect. 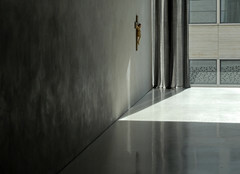 Yesterday we launched a small website to encourage thinking about good museum architecture. It focuses on six themes – connect, show, sense, open, move and site – and hopefully will spark some new ideas about good museum architecture. You’re free to add your ideas (don’t let the Dutch scare you, it’s a bilingual website!). So, what is good museum architecture? That, I’m afraid, is a question without an answer. Or, with many answers. The book explores how architecture can deal with certain characteristics of museums. For instance, how architecture influences the presentation of objects (“show”). The two examples below are from the book and show how a church and a museum built on top of a chapel show their objects. I like them both, but believe they’re very different in their architectonic approach. 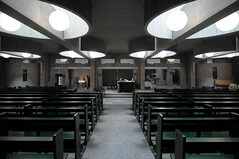 Pastor van Ars Church (design Aldo van Eyck, photo m.by) and Kolumba (design Peter Zumthor, photo seier+seier). Endless rooms with paintings, to me, are rather dull. Even if they’re great paintings. Recently I wrote about DOK where they have interior architecture that seems to encourage learning. It’s semi-chaotic and open. 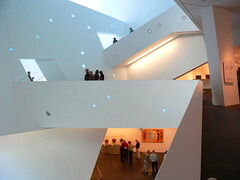 Similarly, I loved the way stairs in the Hamilton building of the Denver Art Museum (and basically that entire wing) encouraged discovery. Every corner I turned was an adventure. Well done. I go to museums to disconnect (if not on business, darned déformation professionnelle that ruins many a good museum experience). So, a museum should help me disconnect. 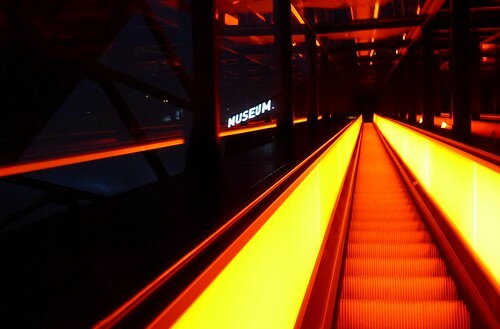 Like the endless escalators taking you into the Ruhrmuseum. I don’t like the design of museums such as the Guggenheim in Bilbao. To me, it creates a distance between the museum and me. “Look how special I am! Dare to come in.” It might be merely the hype. I love it how the Museum TwentseWelle does it, with a wonderful terrace at the street that makes you want to sit down. Entering the museum, then, is only a small step. A museum is a public building. This means it should allow for many public functions. Debates, workshops, special expositions, lunch, and all the other stuff you should be able to do in a museum. Not in some small room in the back, but in the blood and veins of the museum architecture.